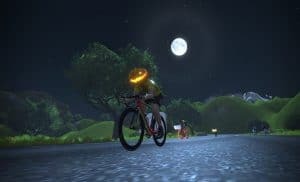 Zwift likes to roll out fun stuff on holidays, especially April Fools’ and Halloween. Today we’re riding bone bikes and wearing pumpkin (or green skeleton) heads. (There may be more silly stuff, but this is all I’ve seen at a quick glance!) We’ve also got jack o’ lanterns and spiderwebs decorating Watopia… and is it just me, or is it permanently night time today? To switch your head, go to Menu>Customize and try clicking the different headware options. My pumpkin head was hidden under the orange cycling cap, while the skeleton head was the runner’s sweatband. 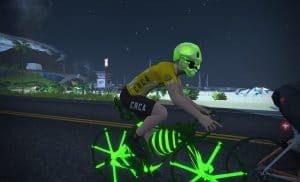 How Fast Is the Bone Bike? 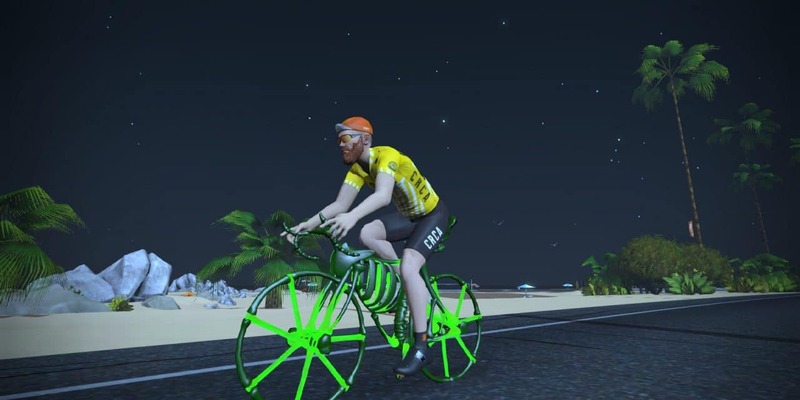 In case you’re wondering… it’s about as fast as the Zwift Carbon with Zipp 808 wheels. On a related note: Halloween is already over in Australia–check out how Shane Miller made trick-or-treaters pedal for candy! 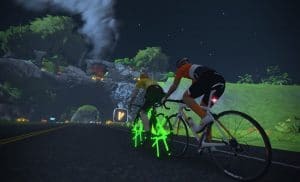 A small detail but I think I saw some will-o-the-wisps while riding through the jungle–which is a fun coincidence as it’s basically my zwifting screen name (Ignis-fatuus). Happy Halloween! It was fun riding a skeleton bike today and seeing pumpkins on the course. I was passed by a few pumpkin heads too!